Congratulations to Joe Byrd! 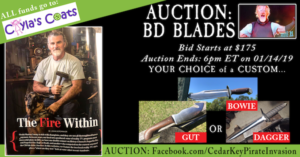 His winning bid of $850 was donated directly to Cayla’s Coats and BD Blades will be consulting with him on his custom creation. A huge “Thank You!” to all supporters who bid in the auction or made donations during this fund drive. Together with $555 in donations, we were able to raise a total of $1,405! 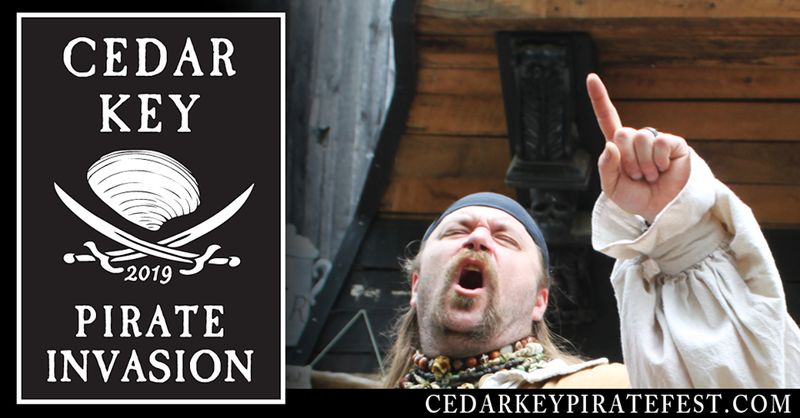 As of December 31, 2018, the Cedar Key Pirate Invasion Weekend (AKA the Cedar Key Pirate Festival) is no longer produced or managed by Bard Productions, LLC. All accounts receivable/payable, outstanding invoices, debts, verbal and/or written agreements transacted before that date with the Cedar Key Pirate Festival will remain the responsibility of Bard Productions, LLC. Beginning January 1, 2019, the Cedar Key Pirate Festival will be produced by a new management team that is being formed to continue operation and promotion of the event. Details will be provided in the near future. Stay tuned for our New Year’s Resolutions! Keep Calm and Pirate On! Event Schedules and the Event itself are subject to change without notice by the Festival Management. Acts of God including fire, mayhem, hurricanes, politics and other chaos are not our responsibility. Copyrights for all content and imagery are held by Cedar Key Pirate Festival, the designers, and/or individual pirates portrayed, and will be enforced. NO PIRATING!